Looking for a vendor that can line bend Polycarbonate. 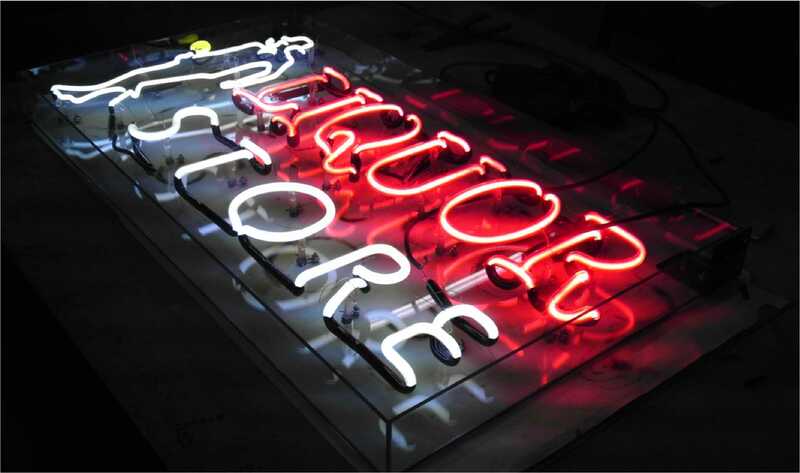 Getting into neon window signs and I am looking for someone that can produce the bent plastic backgrounds. Ditto on the brake (up to 1/8in). I still prefer acrylic (1/4in-3/8) for most window signs. Stiffer than polycarbonate and seems to age a bit better too. You can use solid square or round stock (I use 1in solid rod) for the standoffs. I bought a super nice 3' long heater/bender on ebay for next to nothing. Always use sides for the window signs as this helps prevent warping, protects neon during shipping and allows you to mount 3 hole brackets on top corners for chain and leveling. This is BEST way to level signs in the window. Of course do not use plastic tube supports unless you want the neon units to fall off the background down the road or be written up in certain municipalities. Agree completely on not using plastic tube supports. I don't use them on anything these days - not even the smallest window sign. The neon has a 10 year life and the plastic tube supports a 3-5 year life. There is always trouble down the road. Sometimes the plastic disintegrates in only a couple of years. Acrylic or Polycarb - UL listed or not. all have this problem. I think the ozone produced near the tube surface breaks down the plastic. Throw in some direct sunlight and you really have trouble. I really like the silicone-dipped glass tube supports both FMS and others sell now. Actually some where it can be exist that you need to be care full about neon tubes. No meter what materials (Plastic, Acrylic, or glass) they have used in that sign. so keep clean your neon signs. Marina Mark, what the hell are you talking about? I'm going to have to get Tim Kaine to translate that for me. Are you saying keep your neon signs clean, no mater what background you use? Posting a video sent from one of our members that need help in defining the issue. Usually seen and requiring longer burn in, but any idea why it would happen over an extended time? Thought I'd post some pics of a project I recently put up for a group of owners I've been doing some signs for over 15 years, this is the latest project located here in San Diego in Pacific Beach California. This job was supposed to be up last December, but as you can imagine things don't happen over night like they should in for this project in California and a good reason why business's leave California for other fruitful states in our grand union. This project was no different and unlike other states.....here,anything built on the beach, you have to go through the California Coastal Commission. This establishment won't be ready after much delay until almost a year later, and set to open this November possibly December. 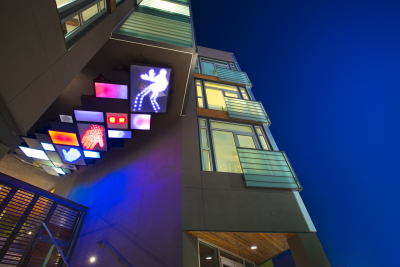 This project was originally composed of a third sign, a 18' tall projecting sign which got denied in the permitting process. Can't get them all in California I guess you can say. So we're left to be happy with what THEY allow us to have. Anyhow, this project is two 4' x 20' Electric wall sign cabinets, 1/8" alum walls and 3" deep open face channel letters spaced 1.5" from the cabinet background. 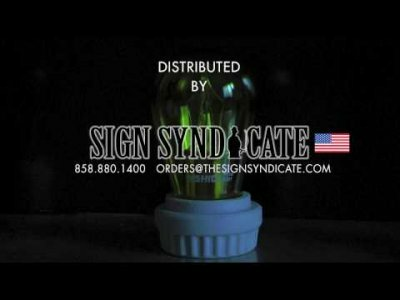 18mm Tri-Phosphor Voltarc Accent 30 border, and Voltarc 15mm Rare Earth Phosphor Sparkling Blue Letter outline lighting. The owners wanted a halo lighting similar to a previous job so we used Our NC LED's Constant Current Green LED Modules for low light subtle Rear Letter Halo Lighting. A big thank you to Joe Walsh of Voltarc for helping us get what was needed for this job, the Neon is Brilliant and of course stands out over the beach night city scape. This Beach won't be needing a light house for lost fisherman after all now thanks to Voltarc! There aren't very many Neon signs on this coast that I know of, in fact....I can't think of any so these signs are a real beacon. They must be because the owners asked me if after installation and first lighting if I could hook up a dimmer......" a wut??!?!" A solo illumination shot of our Green Constant Current NC LED Modules, using just a single stroke for a light subtle offering. Wall Pattern Day. If you're going to do a sign project on a hot summer day you might as well be RIGHT on the beach. All that project stress went away sitting on the scaffolding listening to the seagulls, the crashing of waves, and smell of sea spray. I won't lie, I wanted to just bust out a hammock and go to sleep. Yes, I was working in Van's....I'm in SoCal, so that's all you need to know! Westrim Products Graphed Pattern Paper! I won't go into details but I just want to say, and give a big Thank you to Voltrac, namely Joe Walsh. I deal with reps on a daily basis and vendors all the time. Thank you Joe @Voltarc for taking care of us. Glad you're still in the Neon Industry, and it can't be a surprise you're one of the few left to serve the needs of it. We appreciate you being there!